Chartres Cathedral is considered the finest example in France of the Gothic style of architecture. The current cathedral was mostly constructed between 1193 and 1250. It is in an exceptional state of preservation. The majority of the original stained glass windows survive intact, while the architecture has seen only minor changes since the early 13th century. The building's exterior is dominated by heavy flying buttresses. The west end holds two contrasting spires - one, a 105 metre plain pyramid dating from the 1140s, and the other a 113 metre tall early 16th century Flamboyant spire on top of an older tower. Equally notable are the three great facades, each adorned with hundreds of sculpted figures illustrating key theological themes and narratives. This was my 3rd WHS on the day: after having visited Provins and Fontainebleau I had a couple of hours left before it would get dark. So I drove on to Chartres to see its famous cathedral, knowing that I would not easily go there on a separate visit. I think I have seen enough Gothic cathedrals for the rest of my life. Both Provins and Fontainebleau were almost deserted when I visited earlier this day, but that unfortunately wasn't the case for Chartres. It took me over half an hour to find a parking spot in the city center, which was overrun with Christmas shoppers. Fortunately, the Cathedral is not hard to find. It's a big church in a city of 40,000 inhabitants. But just like Ian Cade states in his review below, I was not really impressed. It is large, but so are most of the other European cathedrals on the List. The facade is undergoing restorations at the moment, as is part of the interior. The cathedral is best known for its stained glass windows. As it was already late in the afternoon when I visited, there was not enough light left to let these windows really shine. The rest of the cathedral is, well, .. a cathedral with cathedral things. P.S. : Outside I noticed a sign that Chartres also is a station on the Road of St. James to Santiago de Compostela. However, it is not one of the elements of the French Route WHS (that holds so many other sites already WHS in their own rights). 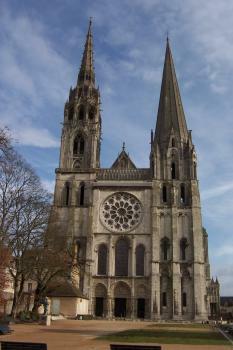 Chartres is often regarded as the prototype of a Gothic cathedral and exemplary for subsequent buildings. Perhaps also because the cathedral was never destroyed and rebuilt, the architecture and decoration were almost unchanged since the 13th century. The characteristic features of the exterior are the abundantly decorated portals of three façades and the two different towers. Despite the asymmetry, the façade looks very elegant and harmonious. The slender spires strengthen the impression of the immense height, everything seems striving to heaven. The visit of the interior left me with ambivalent feelings. The renovation is still ongoing, about half of the walls has already been cleaned. Currently (August 2015), the interior is a strange mix of dark gray and bright yellow and white sections. The photo gives an idea of the before-and-after. The aim is that the interior appears again as it supposedly was in the 13th century. "The rediscovery of the brightness" is the motto. Today we are used to the darkness in medieval cathedrals, which contributes to the awe-inspiring and mystical atmosphere. 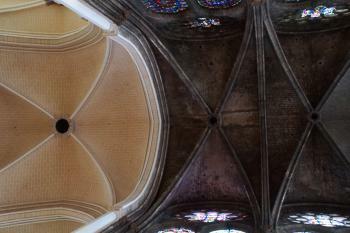 More brightness and more light is not a bad idea, but in Chartres they overshoot the mark in my opinion. Why should a medieval cathedral look like 800 years ago? But to be fair, I should wait with a final assessment until the renovation is complete to see how the perception of the interior and the effect of the stained glass windows will have changed. Or I have to wait another hundred years until the bright colour has become a bit darker again. One of the famous sights in Chartres is the labyrinth, it is the original from the 13th century. Usually, the labyrinth seems to be covered with chairs. But I found the information on the official website (only in the French version) that it is open to pilgrims on Fridays. Well, I was skeptical, because I have not found any confirmation, neither here nor on other websites. But it did perfectly fit into our schedule, so we arrived in Chartres on a Friday afternoon. Well, my skepticism was justified, the labyrinth was almost completely covered with chairs, and no one made a move to put them away. We asked a tour guide and the lady in the gift shop, but the answer was a shrug of the shoulders and the weak explanation with the renovation works. I visited this WHS in August 2012. This huge gothic cathedral could be seen from kilometres away as arrived by car from Paris. The first thing to come to mind was "What on earth is such a huge cathedral doing here in the middle of nowhere?". You can imagine how awestruck the local people must have felt in front of such a building in the Medieval times. I found the central labyrinth and the original stained glass to be very interesting and unique but the rest of the interior was being restored and pretty similar to any other gothic cathedral I've visited. I visited this site on September 11, 2010, a pleasant day trip from Paris with frequent trains both ways. There is no problem getting to the cathedral; its towers dominate the town. The cathedral's stained glass is certainly the highlight though scaffolding and sheets covered several of the windows. The soaring rib vaults are also spectacular. The cathedral is smaller than others when inside, and it can get crowded. It is well worth it to climb the north bell tower not only for a view of that countryside but also for a look at the many architectural details that can only been seen from above. As mentioned before, the labyrinth is covered by chairs. A great guide, in fact it probably will tell most visitors more than they ever wanted to know about Chartres, is Henry Adams' 19th century work. As stated below, one of the most impressive aspects of the cathedral is that it dominates the rest of the town and it sits up from the rest of the landscape, so when driving to it you can easily see it from about 25km away. There are many WHS around Paris but this is the first one I choose when wanting to go off exploring (partly because it also features in Dan Cruickshank’s 80 Treasures of the World), it is renowned for being one of the most untouched pieces of gothic architecture in Europe. When construction started this form was in its infancy, but many of the key aspects of this variety of architecture were pioneered in the rapid construction process of this cathedral. It also features perhaps the finest examples of medieval stained glass that can be found, as well as a whole menagerie of religious imagery which is not limited to the standard Christian fare. This attests to the fact that this site has been regarded as a spiritual centre for thousands of years with the cathedral being built over sacred grotto, there are also features to relate it to the Temple of Solomon, and sun worship. This is an impressive and spiritually significant site, and one that I would have no problem going back to. However as a casual tourist, it was not perhaps as awe inspiring as many of the other Cathedrals I have visited, also I was a little disappointed that the famous labyrinth was partially cover in chairs. It is well worth a visit but next time I would probably try to get a guide to uncover many of the delightful details. The town of Chatres is nice with some great little cafes and excellent chocolate shops, it is easy to get to from Paris (Gare Montpernasse these trains go through Versailles) if you are driving then parking couldn’t be easier as there is a very well signposted underground ‘double helix’ car park only a few hundred metres away. Some cathedrals are the seat of archbishops of important dioceses, and some are located in small, otherwise insignificant towns where they dominate everything. This is certainly the case in Chartres, where you really wonder why they built this magnificent edifice in, well, the middle of nowhere, really. 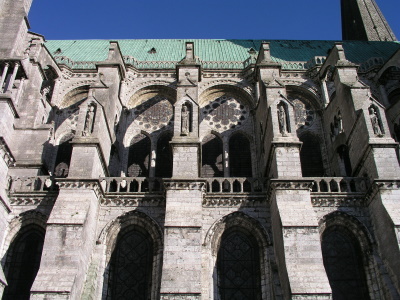 Chartres is a pleasant enough town, to be sure, but one would not imagine a building of this scale there, and it is easy to see how it must have moved medieval pilgrims. It's the high point of Gothic art in France and a masterpiece in every respect. Doubtlessly worth the visit. 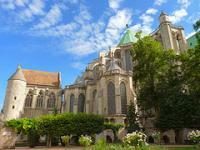 I visited Chartres from Paris' Montparnasse station, accessible using the surface rail (RER). It only takes 50mins or so either way, and the train says Chartres on it clearly. No problems there. The station staff should speak sufficient English to point you to the correct platform. At the station, use the underground pathway to get to the main station, don't cross the tracks. The cathedral itself is a 10 minute walk from the station. It dwarfs anything else in the city, and is so awesome you will probably not notice anything else. You can see it looming in its magnificence from the station, then walk there following your view. You can't go the wrong way, don't worry. On the walk there, there is a nice statue and square. There is no entrance fee. It's the local cathedral, you see. You can go up to the deep dark bell tower, but you better be early because it closes at 3pm. This is the historic Notre Dame de Chartres, Gothic, magnificent and even more atmospheric than its sister in Paris. I have also been to Cologne, Milan and St. Peter's in Rome Cathedrals, this is as 'prayerful' and 'cool' inside, and much more peaceful because there are usually not as many tourists. There are the usual gargoyles sticking their heads out of all corners outside. There is a plaque at the rear in French, justifying its inclusion as a World Heritage Site. Read it yourself, I will not spoil it for you. The view of the city from the rear is not spectacular, but its worth walking back there to see the museum and the view of the cathedral from the back. hill, clearly visible as it had been for centuries Mind boggling and fully functional. but said that we would like to go back to thecity and stay for a couple of weeks. Religious Relics: Since 876 the cathedral's site has housed a tunic that was said to have belonged to the Blessed Virgin Mary, the Sancta Camisa. The relic had supposedly been given to the Cathedral by Charlemagne who received it as a gift during a crusade in Jerusalem. Marian Shrines: Cathedral de Notre Dame. "dedicated to the Blessed Virgin. In the upper church is the chapel of Our Lady of the Pillar and in the lower church one honoring ?Virgini Pariturae,? at which it is said the Druids paid honor to the seated virgin with a child on her knees, in the small grotto that enclosed her. Early in A.D. 300 a Christian church was built over that grotto. In 1195 the present cathedral was begun and was finally completed in A.D. 1250. The stained-glass jeweled windows represent in detail the life and perfections of Mary, Virgin and Mother. Chartres also has Mary's own veil to show pilgrims, contained in a magnificent reliquary. This relic belonged to Charlemagne (742-814), who had it transferred from Aachen to Chartres in 876. The second outstanding relic of Chartres is the statue of the Black Virgin, the "Notre Dame-du-Pilier" in the upper church, the Mother holding her Infant Son on the left while her right hand holds a gold scepter. The niche that holds them is filled with token hearts of gold, offerings for the cures wrought over the centuries through Mary's intercession"
309 Community Members have visited.